What is your favorite memory from camp last summer? 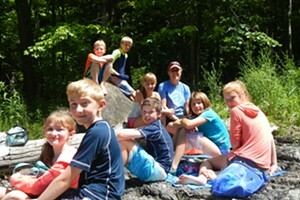 | Camps | Kids VT - small people, big ideas! What is your favorite memory from camp last summer? Warmer days will be here before we know it. In the meantime, we asked local camp directors and staff to reflect on their favorite moments from last summer. From streambed investigations to cannonball competitions, these are the memories that will last a lifetime. Exploring the dried-up streambed with the campers was an amazing experience. Being able to investigate an environment that is usually inaccessible was inspiring for both campers and staff. Sunshine, smiles, cooking challenges, the pool and the old-fashioned Vermont farm. As one of our art activities last summer, campers created a huge mural by painting their own hands in overlapping patterns and filling the geometric shapes with vibrant color. Camp For Me is a special place for adopted children and teens. We have diverse campers from so many different backgrounds, but at camp they come together and make something beautiful, like a mural that becomes bigger and more gorgeous than the sum of its parts. Watching campers beam with pride after working hard to get their first fires with flint and steel and bow drills. A young camper feeling proud that they made it through being homesick and wanted to stay an additional week. Her fellow campers and staff helped her to find the fun in camp. Seeing enthusiastic returning campers run down the hill to get a hug from their bunkmates; hearing the "I Did It Bell" ring to signal a camper learned a new skill; hearing screaming campers cheering down at the waterfront the first time a camper got up waterskiing; listening to our international campers share about their home culture and having other kids really listen and ask questions during breakfast each morning. What I most get a kick out of is the big, raucous energy of the younger kids ... They spend a lot of time in square rooms and boxes, and I love being part of giving them access to the great outdoors and watching them revel in the magic that is available out there in the heart of it all. Watching a child overcome their fear is one of the greatest things to witness as a camp staff. I saw this countless times last summer, whether it was making it one step higher than they thought they could on the climbing wall or leading a song in front of their peers for the first time. My favorite memory is judging the cannonball competition during an all-camp Olympics last summer. On Fridays, the entire group of campers participates in a series of obstacles and challenges. The tasks vary each week, but the energy stays the same. Every single time I saw the face of a child light up the first time they experienced the gentleness and loyalty of our camp horses. My favorite memories always include watching new souls take in what my family and I have been so lucky to take in for the past 24 years. My favorite moment was when the campers built their own soda-can robots. They were so excited to exhibit them at the end of the day and show their parents all they learned.